Wireless Emergency Alert System notifications appear on WEA capable cellphones. 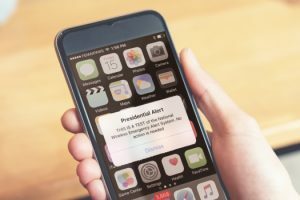 HONOLULU — The Federal Emergency Management Agency (FEMA) in coordination with the Federal Communications Commission (FCC) will conduct a nationwide test of the Emergency Alert System (EAS) and Wireless Emergency Alert (WEA) on October 3, 2018. The test was originally scheduled for September 20, 2018 but due to ongoing response efforts to Hurricane Florence, the alert test was moved to the secondary date option. A backup date is always planned in case of widespread severe weather or other significant events on the primary test date. FEMA and the nation’s emergency management community remain committed to the life-saving activities occurring through parts of North Carolina and South Carolina. Cell phones that are switched on, within range of an active cell tower and whose wireless carrier participates in WEAs should be capable of receiving the national test message and will receive the same special tone and vibration as with all WEA messages (i.e. Flash flood, AMBER Alert). This is the fourth EAS nationwide test and the first national WEA test. The WEA test message will be sent to cell phones. Previous successful EAS national tests were conducted in September 2011, 2016 and 2017 in collaboration with the FCC, broadcasters, and emergency officials. The EAS test is scheduled to last approximately one minute and is made available to EAS participants including radio and television broadcasters, cable systems, satellite radio and television providers, and wireline video providers. The test message will be similar to regular monthly EAS test messages with which the public is familiar. The WEA test message will read “This is a test of the National Wireless Emergency Alert system. No action is needed.” The WEA system is used to warn the public about dangerous weather, missing children, and other critical situations through alerts on cell phones. It allows customers whose wireless provider participates in WEA and who own a WEA compatible wireless phone to receive geotargeted alerts of imminent threats to safety in their area through unique tones and vibration. The national WEA test will use the same special tone and vibration.